I live in the South – home of Southern Fried Chicken. And while every so often I love nothing more than to dig into a grease laden box of hot, crispy chicken, when it comes to everyday eats, I look for something lighter. Read on for my Crispy Oven-Fried Almond Chicken Recipe. I’ve made a couple versions of oven-fried chicken before (Ellie’s is a personal favorite), but I decided to try to make my own version using ingredients I had on hand. I’m sort of a convenience chef, if you will. When times get busy and I don’t have time to go to the grocery store, I have to get creative. So, I winged it. I also tried to keep the ingredient list small and reasonable. I remember when I first really-really got into cooking, I loved watching an episode of Food TV and then going to the grocery store to make one of the recipes that caught my eye on a particular episode. But it seemed like the ingredient lists were always long and/or expensive. Perhaps it was my lack of a well-stocked pantry, but even though I really enjoyed it, I found most of the recipes I really liked too complicated for an every day meal. Oh and for the extra crispy factor, be sure to use a cooling rack over an aluminum foil-lined baking sheet (for easy clean-up). You can lay the chicken directly on the aluminum foil, but by elevating it with the cooling rack, it will help the bottom of the chicken get nice and crispy. 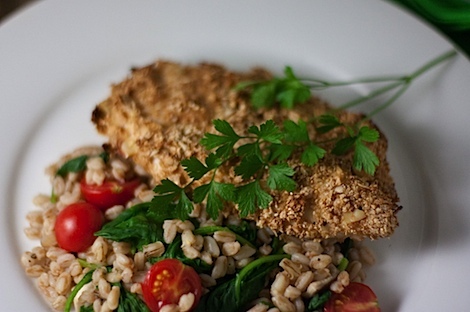 This is a health-ified version of the Southern classic – fried chicken. Made with everyday pantry ingredients, it’s sure to be a weeknight winner that the whole family will ask for again and again. You can use your food processor to chop the cereal and almonds, but I did mine by hand because I was feeling too lazy to clean the food processor. 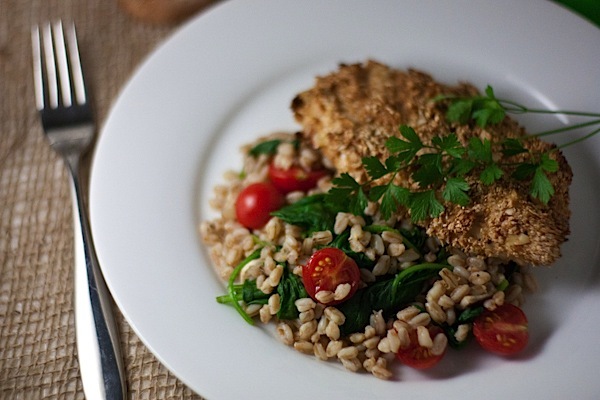 Serve with this Warm Farro Salad (which is the side shown in the photos of this post), rice, or even roasted potatoes. Yum! Place cooling rack over aluminum-foil lined baking sheet. 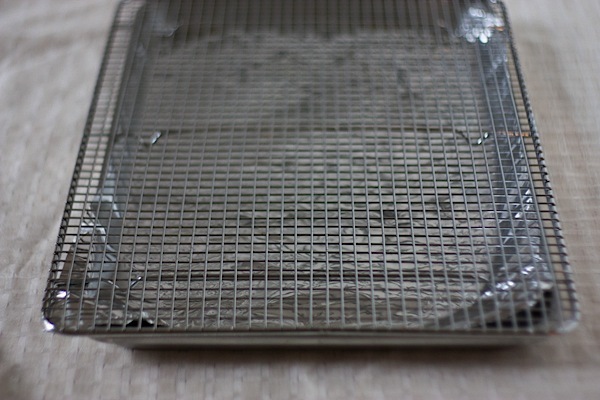 Spray cooling rack with non-stick spray (just near areas where you’ll be placing chicken). Mix cereal, almonds, garlic powder, salt, and cayenne pepper in a wide/low bowl (or other small container with sides). In another bowl similar to the one containing the cereal, whisk together the egg and milk. Dip chicken into the egg mixture, then press both sides into the cereal, be sure to press in the areas that do not easily get covered by the cereal mixture. You may have to pick up some of the cereal and press it in with your fingers. You’re not going to get a perfect coverage, but try to apply as much of the cereal mixture as possible for extra crunch. Place chicken on prepped cooling rack/baking sheet and bake for 26-30 minutes, or until chicken is cooked through (non-pink center or use a meat thermometer to check). When chicken is safe to eat, serve and enjoy! Recipe easily multiplies to serve more. 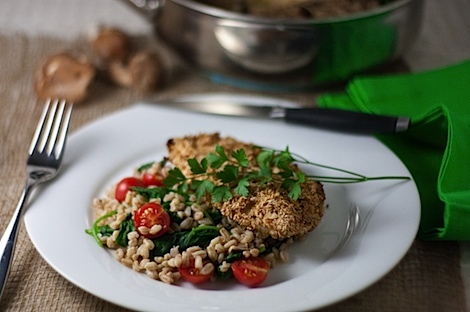 Not the fastest, but this Crispy Oven-Fried Almond Chicken Recipe would make an easy main course for a busy weeknight. In Project Think Positive news, I’ve really been enjoying how your positive thinking has been positive influencing your every day experiences. Success! You guys are rocking out the challenge! I’m working on a post to share some of the stories I’ve read. Can’t wait! And if you’ve countered a negative thought with a positive one and you haven’t shared it yet, I really would love it if you would. Feel free to leave it in a comment, email it to me, tweet it to me, or even post it on my Facebook wall. Do you prefer “real” fried chicken or oven-fried chicken? 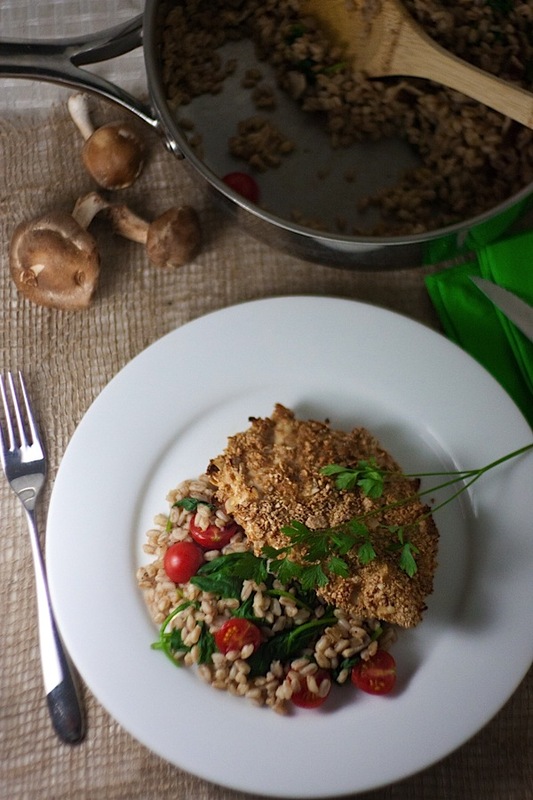 If you’re vegetarian/vegan/pescatarian, have you ever experienced a vegetarian/vegan version of fried “chicken”? What did you think? I’m not a vegetarian, but I can’t say that I really am a fan of fried chicken or oven fried chicken in general. I guess I’m not much of a breading person… but if I do want some, it’s chicken tenders from your average chain restaurant (TGI Fridays, O’Charleys, etc.). Haha, I guess I’m about 7 years old. This recipe looks good though, I think I’d love the crunchy crust! I always used to crave chicken nuggets after a night out, but after going veg I haven’t had them in years – I do like the Gardein chicken tenders quite a bit though! I’ve been eating meat these days but I still love fake chicken!! I was actually telling someone recently that I think I prefer the texture of fake meat to real. I can’t even remember the last time I had fried chicken but this seems like such a great substitute. I love the idea of placing the chicken on the cooling rack for extra crispiness – great one! Thanks so much Rasha! Lifting the chicken really helps give it that extra crunchiness. Yummers! This looks absolutely amazing! Thanks for sharing the recipe, I’ll definitely be cooking it this weekend. I’m glad I found your blog since you seem to have some great healthy cooking options! Glad you found TCL, too, Lyndsi! Thanks for visiting! 🙂 What types of recipes do you usually look for online? Okay, I am bookmarking this one. I love the crispiness of fried chicken but never eat it because of the fat. This is a fantastic option!